I remember walking into WHSmith and seeing a pack of two books by Fiona Gibson on the shelf. The covers of these books are exactly the brightly and alluring covers which seem to always catch my eye so I had to pick these ones up. Problem was I was very organised and put them in my drawer as I keep the books I buy separate from the books sent to review but I done a bad thing and forgot about them ( please form a line to smack my wrist!) 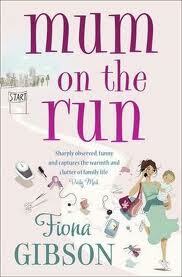 I thought it was about time I read one of these books so I started with Mum on The Run. Laura Swan is not happy with her weight but seems to just plod along without doing anything about it until the dreaded children’s sports day comes around and her daughter Grace is pleading with her to take part in the mum’s race. Finally giving in to her daughter she competes against the very athletic mums and in such a short time during this race her world comes crumbling down in more ways than one. Laura decides to take drastic action and is going to shift the extra pounds but is this going to be enough to fix everything around her? This is the first book I have read by Fiona Gibson and I can now say it definitely will not be my last. This book was pure entertainment right from the first chapter which had me laughing away. Laura is such a loveable character it doesn’t take long for us to warm to her and we find ourselves routing for her all the way through the book as she tackles situations many of us have found ourselves in. The book flows at such a fast and easy pace that I finished it in an afternoon in the sun. I loved the way the author tied the ending up as I am sure you all know by now I do not like to be left on a cliff-hanger! I did find the parts of the storyline very predictable but for me this didn’t effect my enjoyment of the book as it was great to see how everything unfolded and the day to day humour which is used in this book more than makes up for the lack of suspense. If any of you are like me and not read any of Fiona Gibson’s previous books then I would definitely pick one up especially thoughts of you who like the writing style of Jane Costello as this book had a similar feel to her books. I cannot wait to start another book by Fiona Gibson lucky for me I brought The Great Escape too so I am sure you know what I will be reading tonight!